I’ve been playing with the trial version of Moments of Inspiration (MoI) a handy 3d modelling package which has a striking resemblance to Rhino. Thats unsurprising since it was created by the original develoer of Rhino. Fortunately MoI is about 1/10th the price of Rhino. 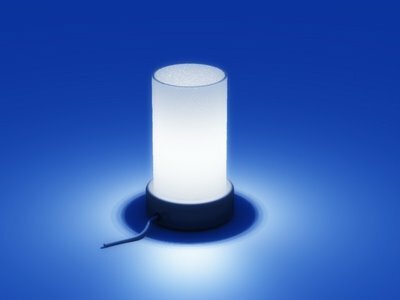 The image above is a render of the second model I’ve made using MoI – a fairly simple bedside lamp I created in about fifteen minutes. I exported the triangulated mesh from MoI as a Wavefront Obj file and imported it into Vue 6 Infinite where I’ve textured it and then rendered it. The textures on the lamp are not designed for fast rendering. The shade is a translucent material with a slight displacement applied but this gave the look I was trying to achieve. I also used several point lights inside the bulb to create a light source which creates a more realistic light for a close up render than a single point source does. I’ve uploaded the model to my web site so if you’d like to download it you can get it from the download link at the bottom of this post. I’ve tested it in Vue 6 Infinite on a PC hopefully it should work in other versions. You may want to turn off displacement mapping in the material and reduce the number of lights.